Below some of the features of the sweepstakes spreadsheet for the upcoming women’s soccer world cup in 2019 in France, including automatic update of the actual match results so that you don’t have to. Our Women’s World Cup 2019 Spreadsheet for France will allow groups of up to 50 people to run a sweepstakes or pool based on the outcomes of the group and knockout matches. Tags: France 2019, womens world cup. See the likely group winners after adjusting your predictions for the actual results (including the more complex 3rd place finishers who progress). 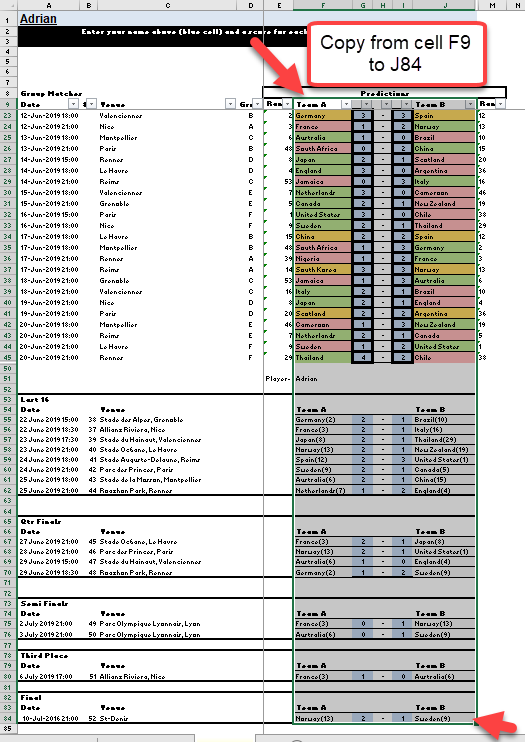 Automatically addresses the tiebreaker rules for France 2019 (goal difference then goals then matched between the tied teams etc- see rules). Provides statistics on who your players chose including giving a breakdown, per match, of how many people predicted which result. 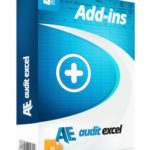 The spreadsheet is built in Microsoft Excel 2013 but will work in all versions with some loss of functionality if you are using Excel 2003 and Excel for Mac (if you use a Apple, please email us and ask for the non updating version). Below the video clip explaining how to use the France Women’s World Cup 2019 Spreadsheet. Once you purchase the spreadsheet, you will be able to download a zip file which contains 2 files as shown below. The first file (1) (‘2019-Womans-World-Cup-Spreadsheet-v1-SweepstakesInput2003’) is what you need to send to the other players. The second file (2) (‘MASTER2019-Womans-World-Cup-Spreadsheet-v1-Sweepstakes-upto-50_2003’) is for the organiser and is where all the predictions are saved, where the match scores are automatically updated, and the sweepstake points are compiled. Before you send the files out, you will need to decide on the point scoring. 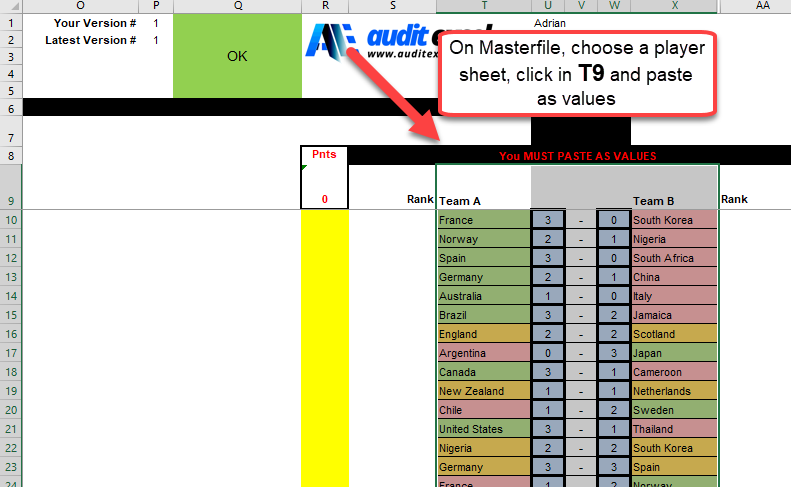 When you open up the ‘MASTER2019-Womans-World-Cup-Spreadsheet-v1-Sweepstakes-upto-50_2003’ spreadsheet, and go to the instructions sheet, you will be able to decide how the points work. Once you have decided this, you can inform the players of how it will work and send them the ‘2019-Womans-World-Cup-Spreadsheet-v1-SweepstakesInput2003’ spreadsheet. Note: per the competition rules, teams on the same number of points will be separated by net goals and goals scored, then comparing their head to head results. The spreadsheet will take this into account. Note: at this stage you only get points for who progresses. Predict a winner in each match instead of a draw and penalties. Save the file and send it back to the organiser. In the player predictions spreadsheet, copy from cell F9 to cell J84. Go to the masterfile, choose one of the player sheets (e.g. player 1) and PASTE AS VALUES starting in cell T9. In case it isn’t emphasized enough, PASTE AS VALUES. Do this for all the players. You can change the sheet names to reflect the player’s name. During the tournament, all you have to do is open the master spreadsheet and let it connect to the internet. We will update the match scores periodically and these will be pulled through to the spreadsheet (to see how we do this, look at the video on Importing data from the web ). As shown below, on the Masterfile sheet, as the real scores come through the cell colours will change to show that it is an actual score. Note also the Prediction column (column K) which shows how many people chose a home, draw or away win. On the individual player’s sheets in the master file, as the real scores come in, you will see the matches that are finished (dotted cells), the total sweepstake points scored and a breakdown of how the points were earned. 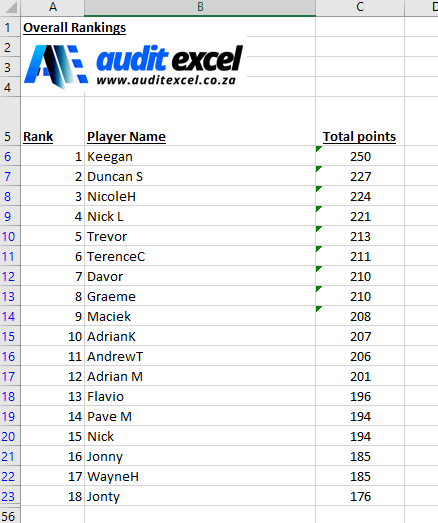 On the ‘Overall Pnts’ sheet you can see a table ranking all the players. 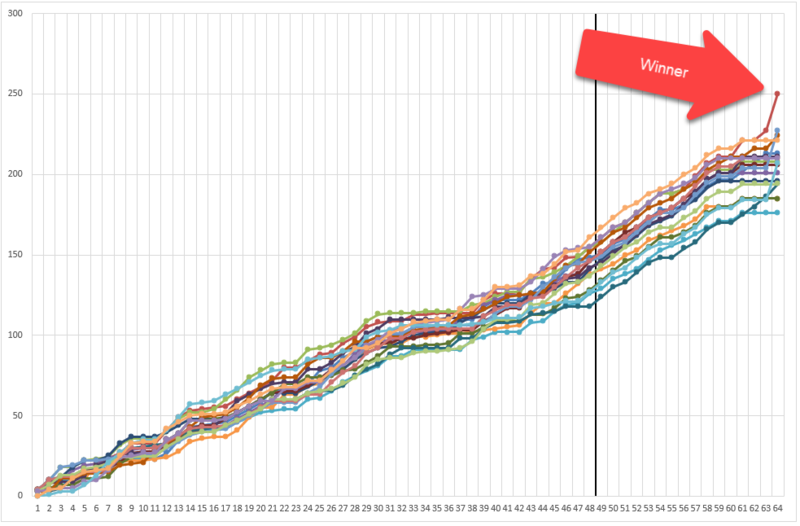 There is also a chart sheet showing the player rankings as each match progresses (worm chart). As shown below with one from the men’s tournament in Russia in 2018, it is generally tight! A recent sweepstake spreadsheet was for the rugby world cup. Well all finished and what a great result for us. [NEW ZEALAND WON 🙁 ]. 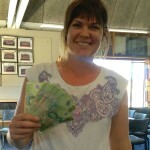 The winner of our picks was April Barnett. We had 40 entries which was a good number. Q: Using an Apple Mac, the live scores updated the first time I ran it and then didn’t update?